Solar powered Christmas lights have got to be one of the best inventions ever; at least in terms of light decorations. All of the strings I own have to be plugged into the wall just like the good ole’ days. I can’t even begin to fathom what my parents’ reactions would have been to solar powered lights that could easily be strung up in or out your own home. They both passed away years ago but I remember my father pulling out the lights, plugging them in and going through them one by one. No doubt it took a while with multiple strands of light and a restricted number of sockets to work with. He would have loved just being able to charge them and let all the lights turn on naturally to see how they look. I currently live in an apartment building but these lights would look great wrapped around the windows on the inside to bring some soft glow to the room. I also have a balcony on a third floor which would do great with some lights wrapped around them. The fact that I wouldn’t have to worry about finding a socket and dealing with extension cords when using these lights would give me a lot more decorating flexibility. 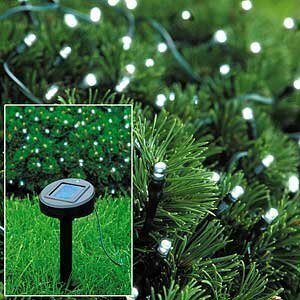 I am confident that I could find a use for the solar lights year after year as long as I am living somewhere that sees the sun at some point. Probably wouldn’t be too useful if I lived underground. 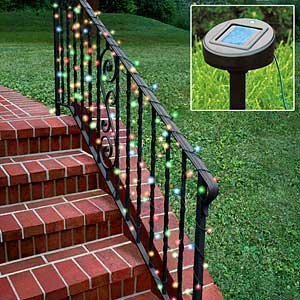 Click to see more solar lights. What I like the most about the ones I found is that they can fit anyone’s tastes. Not only do they come in classic white but also multi-colored as well as different solid colors. And the biggest pro of course is that you no longer have to worry about your electric bill increasing every holiday season simply because you want your house to be beautiful and sparkly for Christmas. They could replace most of your traditional string lighting because many of them are inside/outside and are waterproof so that you do not have to worry about bringing them in during a rainy day. Solar panels can be placed in the ground or in a window to charge during the day. I looked online for ones that have a number of positive user ratings because I know sometimes lights can be fickle and I would hate to consider ones that have a history of not working. These have different styles of lights from a dim handsome glow to an outside colorful light show. 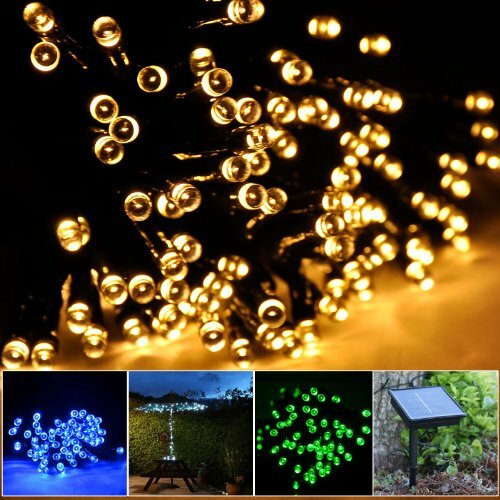 I currently do not have anything that works well for decorating outside of an apartment so I would love to pick up a strand of the Solar Multicolor LED Christmas Lights to add a pop of color to my balcony. I can’t safely decorate with lights inside because my cats have a serious addiction with destroying anything on a string.